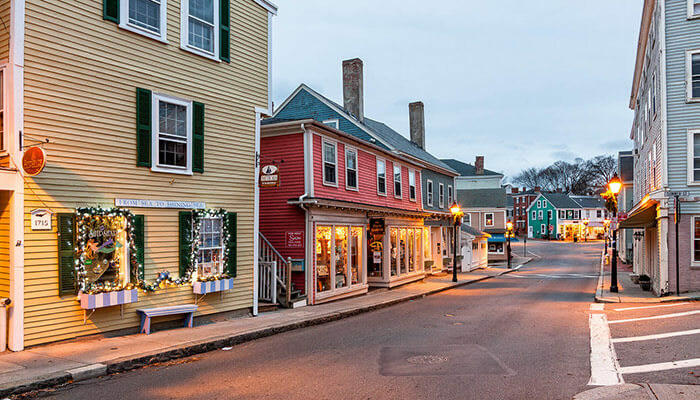 In the coastal town of Marblehead, MA, you can stroll past historic homes, shop at numerous unique boutiques, peruse a 17th century graveyard, dine on fresh lobster, and so much more. Marblehead is a very walkable town and some say that strolling the streets feels like you are walking through a living museum. Marblehead has over 300 colonial-era homes lining the scenic streets of downtown, which is the most of any town in America. The colorful houses are a treat for your eyes and you will find historic plaques placed on each home, giving you the year of construction, the name of the first owner and their profession. Shop at the local boutiques. While in the downtown historic district, you will find an array of charming small shops to explore. Marblehead is filled with small businesses and big chain stores won’t be found. A true Marblehead original is F.L. Woods — it started out 75 years ago as a nautical supply store and has since expanded to American-made clothing. One of the biggest highlights of the summer schedule is Marblehead Race Week (which was established in 1889). Race week takes place during the last full week of July but don’t be alarmed if you can’t make it then as there are numerous regattas throughout the season. As the “birthplace of the United States Navy”, you can imagine that Marblehead takes boating seriously. Pack a picnic (we recommend Shubies Marketplace to help you with this. Hard to beat their wine selection, prepared foods, and made to order sandwiches!) and watch hundreds of sail boats grace the sea from one of the public coastal parks. The Marblehead Festival of Arts was founded in 1962 and has a rich history of producing a premier summer arts festival. Though they operate throughout the year with seasonal events, their signature festival is over the July 4th holiday week. The July Festival hosts a wide range of art exhibits, outdoor music concerts (overlooking Marblehead Harbor), the Street Festival, Film Festival, Artisans’ Marketplace and many other cultural activities. It is truly a highlight of the year for locals and visitors. Being right on the coast, Marblehead is home to many lobsterman which means the town has some of the freshest lobster rolls you can find. We recommend enjoying one at either The Barnacle or The Landing, two waterfront dining options in the historic downtown district. Another option is grabbing a few to-go from the Muffin Shop (yes you read correctly, the Muffin Shop serves a mean lobster roll) and walking up to crocker park to enjoy your lunch overlooking the harbor from one of the many park benches. During the Summer months, everything in Marblehead seems to focus around the harbor and water activities. Little Harbor Boathouse or SUP East Coast Style are two great options for renting gear to get you out on the water. In the center of the historic downtown district of Marblehead sits the Jeremiah Lee Mansion which is a magnificent colonial Georgian home built in 1768. At the time, Jeremiah Lee was the wealthiest merchant and ship owner in Massachusetts. The mansion is preserved in its nearly original state with historic decorative elements, including rare 18th century English hand-painted wallpapers (the only such wall treatments still surviving in place!). The house stands as a tribute to both colonial America’s strong ties to England and its independent commercial success. It is open for tours June – October, Tuesday – Saturday 10 AM – 4 PM. Doing a “neck run” as the locals call it, is a must-do when visiting Marblehead. The scenic drive along Marblehead Neck is about a 4 mile loop so it can be easily done by car or on foot. Take in the beautiful homes, landscapes and views before reaching the end where you will find Chandler Hovey Park. Here you find Marblehead’s unique lighthouse, an iron skeleton structure, that welcomes boaters to Marblehead Harbor. On the way back to town, stop at Devereux beach, grab an ice cream from the Neck Run Cafe, and enjoy the salt in the air and your toes in the sand. The Glover’s Regiment is a group of re-enactors that portray members of the Marblehead Militia group from the Revolutionary War. The Marblehead Men, who were led by John Glover, are notably notorious for helping Washington cross the Delaware River. Every July the Glover’s Regiment sets up a summer encampment at Marblehead’s historic Fort Sewall. The colonial camp, complete with tents, cooking fires, craft activities (such as marine rope work, clothing repairs, needlework) and a selection of merchants are open for the visiting public to view and even purchase reproduction 18th century goods. You truly will feel like you stepped back in time to the American Revolutionary War! Other notable places to check out include: Fort Sewall, Old Burial Hill, Marblehead Museum, and Abbott Hall (which houses the famous painting “Spirit of 76”). The Harbor Light Inn is the perfect accommodation for your summer getaway. Situated in the center of the historic downtown district, guests can walk to all the major sites, shops, restaurants and harbor. Start your day with our full breakfast buffet (complimentary to all overnight guests), explore everything Marblehead has to offer, and then come back to the inn to relax by the private outdoor pool. To book your stay, call us at 781-631-2186 or reserve a room online!